President Donald Trump has yet to show real evidence of massive electoral fraud. Maybe he should look back in time to George Parr, one of the biggest manipulators of U.S. elections in history. Donald Trump insists on the unfounded claim that voter fraud led him to lose the popular vote in November. While no serious expert gives credence to his complaint, just a few decades ago some U.S. elections were indeed shamelessly manipulated. Candidates who wanted to win, for example, would forge alliances with the Parr family, which for seven decades dominated politics in South Texas by manipulating thousands of poor and illiterate Mexican American voters. Among the politicians who sought the help of George Parr, aka "El Patrón" or "Duke of Duval," was Lyndon B. Johnson, during his campaign in the Democratic Party's primary for the U.S. Senate in 1948, long before he became president. Johnson, then in the House of Representatives, flew in a two-seater airplane to Parr's ranch in Duval County, the second largest building in the county after the local high school. He knocked on the door of the mansion and Parr answered in slippers. “Mister Parr, my name is Lyndon Johnson. I'm running for the U.S. Senate. And I have come to ask for your support,” said Johnson, who at 6-foot-4 was a full head taller than Parr. “You have it,” Parr replied, offering a handshake but not inviting Johnson to come inside. The conversation seemed to be over, but the ambitious young politician did not give up. “I am very thirsty after the flight down here. I wonder if you could spare a drink of water,” Johnson asked. And that's how the issue was settled, author Anthony Carrozza wrote in his book 'The Dukes of Duval County,' to be published in November. Univision News had access to an advance copy. On primary day, Johnson defeated former Texas Gov. Coke Stevenson in the Parr-ruled precincts by margins of up to 99.1 percent. Johnson won the overall vote by just 87 ballots, thanks in part to Luis Salas, an elections judge who worked for Parr, who created a ballot box with 200 fraudulent votes three days after election day as the votes were being counted. From the second half of the 19th century to the first half of the 20th, political operators like the Parrs manipulated elections in big cities like New York and Philadelphia as well as some rural areas on the border with Mexico by taking advantage of the arrival of immigrants not familiar with the U.S. electoral system. The bosses used bribes and threats to gather votes. Carrozza wrote that the Parr family won the support of Mexican Americans, who accounted for 90 percent of Duval County's population, because they were seen as benevolent, unlike other Anglo landowners in the area. The patriarch, Archie Parr, was a cowboy who went into local politics. He became popular one election day when he took the side of Mexicans after a group of Anglos shot three Mexicans to death on the main street of San Diego, the county seat. His son George inherited his popularity. He spoke Spanish fluently, knew the slang used along the border and tried to get to know every county resident. The Parr family helped neighbors when they were sick, fed the hungry and paid for funerals. But in fact Mexicans in Duval and its surroundings lived in misery at the time, and local landowners protected by the Parrs paid subsistence salaries even as South Texas experienced an oil boom. Meanwhile, the Parr family grew rich. George Parr had a construction company that won every Duval County contract for work on its roads. He also controlled the distribution of beer across the county, as well as an oil company that operated 130 wells. “I found no record of [Parr] ever having attempted to improve the living conditions of the tens of thousands of Latin Americans forced to exist in squalid slums, on near-starvation wages, throughout his domain,” journalist Gordon Schendel wrote in a 1951 report in Collier's Weekly. The Parr machine reached its peak during Johnson's election to the U.S. Senate. At the time, winning a Democratic primary anywhere in the South guaranteed a victory in the general election because of the party's support for segregation. Shortly after Parr and Johnson died, Judge Salas confessed in a 1976 interview with the Associated Press that he had stuffed a ballot box with 200 fraudulent votes for the future president. “Johnson did not win that election. It was stolen for him, and I know exactly how it was done,” Salas said, adding that he wanted to talk about the case because he wanted “peace of mind and to reveal to the people the corruption of politics.” He also said that he had confirmed he would not be prosecuted, apparently referring to the statute of limitations. The famous Box 13 contained votes of people who were dead or had disappeared, and those who had no idea that an election was being held. Parr used several different ways to make sure his candidates would win. He once offered tequila from a tent set up next to a polling place, and regularly paid taxes for those who agreed to fill out their ballots with his picks. Other researchers have reported that South Texas political bosses like James Wells brought people from the Mexican city of Matamoros to vote in elections in Cameron County. 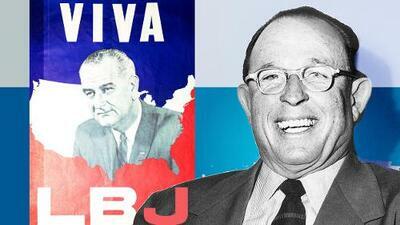 Parr also helped Johnson in 1960, when he was the vice presidential candidate under John F. Kennedy. News media reports at the time argued that Mexican Americans in Texas strongly backed Kennedy because he was Catholic and used Spanish in his campaign. But Johnson biographer Robert Caro recently raised the possibility that Parr illegally helped the Democrats to win Texas – by 46,000 votes over Richard Nixon. Kennedy won Illinois by a mere 8,800 votes, thanks in part to help from another political boss, Chicago Mayor Richard J. Daley. If Nixon had won Texas and Illinois, he would have won the presidency. Parr's hold on power was already weakening by that time. Mexican Americans who returned from World War II had taken advantage of the G.I. Bill to enroll in universities and understood that they did not need Anglo political bosses. Local, state and federal officials at the same time were stepping up their investigations of his activities. Critics accused him of ordering murders and stealing millions of dollars, but over a long time he went unpunished, although he had spent nine months in prison for tax evasion in 1936. Ultimately, he was convicted of tax evasion again in 1974 and committed suicide after his appeal was rejected the following year. He was 74. His main heir, nephew Archer Parr, had been previously convicted of lying to the grand jury that indicted his uncle. Experts insist that electoral fraud is much less frequent now because of several federal laws that established safeguards. “Political machines still exist in some counties, but they are less common now and the safeguards against fraud are much stronger,” said Justin Levitt, a professor at the Loyola Law School. Fraud is more frequent in local elections, he added, because the total number of voters is usually so small that just a few votes can tip the balance. An electoral fraud scandal erupted in May in a local election in West Dallas, Texas, and allegations of fraud rocked balloting last year in Riviera Beach, Florida. Political bosses like the Parr family started to disappear because of election law reforms as well as increasing voter education. Suspicions about electoral corruption linger in South Texas, where some are suspicious of the work of women activists known as “politiqueras," who help neighbors who don't know the system to vote. Some of the women have been convicted of bribing voters with beer, cigarettes and cocaine. It's been four decades since the Parr family lost its power, but the family's name left its mark on the region. “Even young people know about him,” said Melissa Treviño, a journalist with the Alice Echo News newspaper. Carrozza said some people in Duval County are still afraid of Parr. “Even now you find people who don't want to talk about him because they fear reprisals,” he said.